The political targets of Sustainable Development include the Magna Carta and the Declaration of Independence. The economic target is free enterprise and the ideals of private property. Justice becomes a fatality of this new order. Several years ago I began working to create a visual depiction of the grand threat facing liberty in America. The sketch was a shape that looked like a weed and its root. With study I came to learn that the shape reflected a dialectic process. Dialectic is the process of synthesis or resolution that arises out of the conflict between a thesis and an anti-thesis. First, understand the difference between a natural dialectic and a man made or artificial dialectic. A naturally occurring dialectic arises from historical events. For instance; In 1776 King George represented the thesis in a natural dialectic. A political fusion between Agrarian, Commercial and Guild classes of Colonists constituted the anti thesis. The American Revolution was the conflict between the thesis and the antithesis and brought about the resolution – The Articles of Confederation and the perpetual Union. An artificial dialectic is created when organized political action gradually manipulates civilization by altering understanding of history and by controlling present reality. One way this can be pursued is through the use of the Fabian Society political tactics of Penetration and Permeation. Today, America and the world are being swarmed by such a manipulation. Currently this is being accomplished under a global banner called “Sustainable Development”. Yesterday, the global banner was called “Total Quality Control”, and before that…. For current discussion I will address the artificial – man made – dialectic propelling Sustainable Development. Once an understanding of Sustainable Development is achieved, men and women of good will can be more easily joined to restore and protect Liberty and Natural Law; mutual respect for each person’s individuality. In another essay I will look more closely at the vision of the America experience and contrast it with Sustainable Development. From that a sketch can be drawn describing the natural dialectic of our time; the conflict between Liberty and Tyranny; Natural Law and legal positivism, the Declaration of Independence and the Declaration of Human Rights. An artificial Dialectic is a process that poses seemingly opposite objectives. It is intended to result in a predictable outcome. It is a form of psychological manipulation that utilizes the identification of a ‘thesis’ and corresponding “anti-thesis”. In the case of an artificial dialectic the thesis and the anti-thesis are chosen and pursued to achieve a predetermined “synthesis” – the real objective of the sponsors. The challenge for these evil doers is to bracket the public’s “choice” between contrasting alternatives each predicated on legal positivism. Legal positivism is the notion that there is no higher law than the law imposed by centralized human authority. Under a régime of legal positivism the “rights” of man are granted and revoked – like an animal’s “rights” would be. Legal positivism is rooted in the philosophy of August Comte and has been nurtured by gradual political action. The “thesis” of this artificial dialectic is formed by people and organizations who advocate combining the force of government with the power of business. Under Sustainable Development this end is accomplished through the creation of “public/private partnerships”. The first Sustainable Development business council was formed in 1972. It was called the Business Council for Sustainable Development. It was formed by Prince Charles and included a who’s who list of multinational corporations. Today, Sustainable Development is promoted through “partnerships” between government and aristocratic foundations, Non-Governmental Organizations (NGO’s), non-profits, many multinational corporations, compliant businesses, non-profits and sustainability grant recipients. Watch for the existence or emergence of local business councils modeled on this concept. Recognize how legislators, executive department officials and the high court justices are nationalizing and globalizing a “new” economic system called public/private partnership. Many members of local Chambers of Commerce and Farm Bureaus believe in free enterprise; however, the U.S. Chamber of Commerce and the American Farm Bureau and other certain other industry organizations are NGO’s (Non-Governmental Organizations) accredited by the United Nations. Most NGO’s exist to advance policies that implement Sustainable Development. Members of these groups it would be wise to examine what the organization truly stands for. The artificial dialectic’s populist “anti-thesis” has been designed to rally the groupings of people around the concept of social justice. Permeators of the anti-thesis are careful to avoid, even a minimum, exposure to the principles equal justice. Equal justice is the concept that all people are independent and equal under the law. Social justice uses the law to reengineer society. The objective of Sustainable Development is the end of the era of equal justice. “Not possible” you say. “Americans would never accept tyranny’s silent revolution”! But might Americans accept a new cover on an old game? 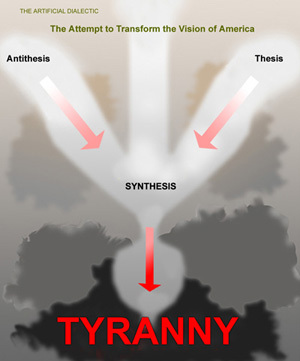 Would Americans accept an evolving Fabian system of economics: a centralized, controlled and managed economy with the objective of abolishing private property and free enterprise; and a communist system of justice; if they were wrapped with a “new” central organizing principle? Such is the purpose of the environmental movement. The environment movement is the camouflage covering the transformation of America. Sustainable environmentalism attempts to put nature before ordinary man. Man’s property, his liberty and his life become subordinate to the elitist manipulation made in the name of the environment. Realizing the central purpose behind today’s environmental scares is the key to understanding the tyranny of Sustainable Development. The real purpose behind the environmental movement is to deliver control over land and resources to corruptible corporate socialists. The phony “battle” between the left and the right is, by design, moving society downward, left – right, step-by-step, toward the “New” world of “Sustainability”. A caste system is being established comprised of a ruling elite and the rest of us. Many think they can get a seat at the ruler’s table by becoming compliant with Sustainability. In the end, they too are but chattel ruled by the elite. In most cases the rewards of compliance will be short-lived. The posterity of the collaborators will suffer with everyone else. Sustainable Development is the synthesis of this artificial dialectic. At the local level this synthesis is achieved though the process of “stakeholder” or “visioning” councils. These local councils coordinate Sustainable ACTION plans in accordance with policies and “tools” designed and delivered by higher tier councils. This “reinvented” American government is the structure of a state directed soviet. As the Sustainable synthesis or “consensus” occurs, America will experience what Al Gore said will be a ‘deserved’,“wrenching transformation”. The purpose of Sustainable Development is to create a government controlled society. A government controlled society is the trap door to the black hole of tyranny. The tonic of Sustainable Development is the honey of grant money – a candy laced with poison. Business insiders receive short-term economic benefits from Smart Growth policies. The politically powerful left promotes the anti life, anti liberty, and anti property program called the Wildlands Project. The red zones represent over 50% of the American landscape. These areas are to be devoid of human presence. The yellow zones are “buffers” to these Wildland areas.The buffers are to become highly regulated zones with very limited uses. The black dots are smart growth or human settlement zones which are to be subject to increasing controls on how you live, raising shortages and increasing restrictions on your mobility. This map was prepared based on documents taken from the UN’s Geneva headquarters. 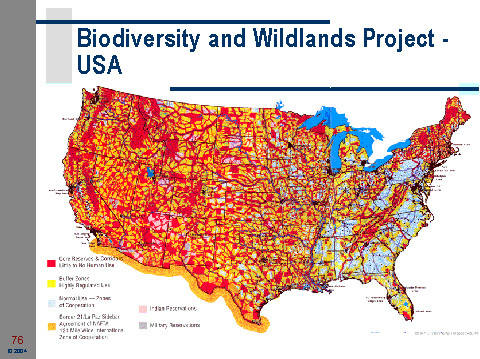 In 1994, the US Senate was ready to ratify the United Nations Biodiversity Treaty which was to guide the American Wildlands Project implementation. Upon presentation of this map the vote was cancelled. Nonetheless the American Wildlands Project is being implemented by agencies of the federal government working in concert with NGO corporate partners like The Nature Conservancy. For more information go to www.TakingLiberty.us. The combination of the Wildlands Project and Smart Growth is the land use element of United Nations Sustainable Development/Agenda 21. The federal government has been committed to Agenda 21 since at least the United Nations Earth Summit Conference which was held in Rio de Janeiro, Brazil in 1992. 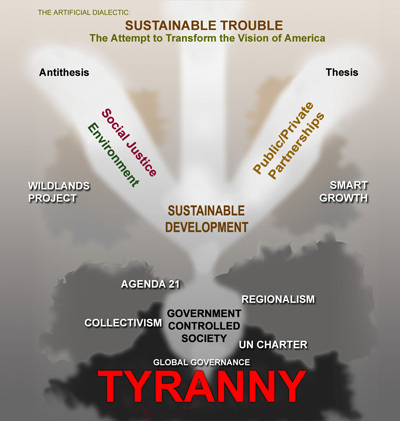 Agenda 21 seeks to regionalize America to the benefit of a shrinking number of political-economic insiders. Agenda 21 achieves this by regionalizing nations. Regionalism works to blur political boundaries – which allow elected representatives to dodge accountability. This blurring of boundaries, when coupled with a raid on the public treasury is used by state collectivists to gather the riches of the people. The intention of state collectivism is the abolition of private property and government control over human action, forcefully imposed by replacing individualism with collectivism. 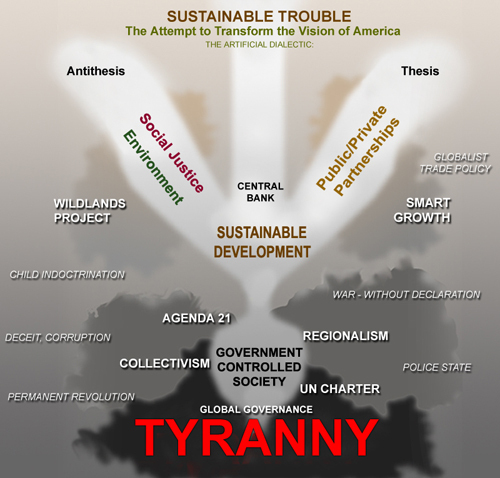 This is the real essence of Sustainable Development/Agenda 21. Agenda 21 is designed to implement the United Nations Charter. Global governance in accordance with the United Nations Charter is the goal of Sustainable Development/Agenda 21 policies. The Charter of the United Nations is premised on the idea that ordinary human beings are “biological resources” to be arranged by the elite into a sustainable number of worker bees and bee keepers. The United Nations Declaration of Human Rights declares in Article 29 Section 3 that: “Rights and freedoms may in no case be exercised contrary to the purposes and principles of the United Nations”. Under the U.N. Charter your rights become dependent upon your usefulness and your compliance to the will of the elite. Legal positivism rules your life. Your independence is lost. Your fate is determined by others. Humanity is trampled. Ordinary human beings, regular Americans – liberals and conservatives, believers and non-believers, young and old, need to unite to counter the revolutionary Sustainable transformation of America. The starting point is in Understanding Sustainable Development. At its root Sustainable Development is a spiritual battle brought by evil against good. The political targets include the Magna Carta and the Declaration of Independence. The economic target is free enterprise and the ideals of private property. Justice becomes a fatality of this new order. Sustainable Trouble is the transformation of America; away from a land of the free; where your life, your liberty and your property are yours; and away from a land of limited government, where law-making is subject to Natural Law. Sustainability is a political system leveraging over 100 years of gradual political infiltration, evidenced, through policies, acts, bills, decisions, agreements and treaties. It has created a political system where rights become granted privileges and can be revoked. The thrust of Agenda 21/Sustainable Development is to regard ordinary human beings as simply biological resources to be managed. At the core of a modern big government system is a central bank – the grand daddy of insider business/government partnerships. What is particularly telltale about Sustainable Development is how contrived programs of political right and left wings combine to achieve Sustainability. Both sides support mandatory government education programs. Note the bipartisan (Bush/Kennedy) support for “No Child Left Behind” – the federal child indoctrination mandate designed to assure that the next generation is indoctrinated and molded into compliant global citizens. The most chilling aspect of Agenda 21 is the global educational indoctrination element that has reached into nearly all schools. EdWatch, www.EdWatch.org, based in Minnesota, has thoroughly assessed the deliberate plan to mold our children’s attitudes, values and beliefs without awareness of the meaning of liberty. Take control of your child’s development. Both sides give support to globalist trade policies that surrender American sovereignty piece by piece to political globalists at the World Trade Organization. The latest piece is called “CAFTA”. The real purpose behind current American globalist trade policy is the advancement of global corporate socialism – a “partnership” between government and business and the systematic elimination of Free Enterprise. An ample dose of deceit is justified as a means to achieve Sustainable ends. Deceit and corruption is the rotting foundation of the fraudulent environmental movement. The raid of the public treasury is the poison fruit that motivates sustainable mercenaries to use our tax money while they carry out their dirty deeds. Sustainable policy is gathering all America’s resources into the hands of government and its corporate socialist partners. Big government makes war – without declaration. A fully implemented Permanent Revolution – war, revolution and terror – is evolving as a final stage tactic of Sustainable policies. Sustainable strategy is designed to cause confusion, division, dependency and accelerating crisis. A police state becomes inevitable and global governance follows. Sure, each subset of contemporary political globalists wants to design the details to the benefit of his or her buddies, but the fight is phony. The real fight is between liberty and tyranny, not over which tyrant is in control. In 1959, Nikita Khrushchev visited California’s Disneyland. He said; “We [tyrants] will bury you – without firing a shot”. Back then I thought he was a crazy old man. Today, I think it is time to think clearly and make sure that the silent and insidious advance of tyranny does not control the 21st century and beyond. The challenge facing Americans today is enormous. Posterity will suffer horrific consequences from Sustainability policy if adults fail to perform our duty. It is time that we understand the insidious transformation of the grand American experience. Learn how you may be unintentionally feeding the artificial dialectic of Sustainable Development. If you are – transition your ways to the cause of liberty. Let men and women of good will rally around parenthood, property and the moral and legitimate exercise of government authority. Do not be fooled: It is liberty that we must preserve for future generations if we are to have a healthy planet, rising prosperity, genuine peace and a life of one’s own. Let us each renew the spirit of America’s grand purpose. Michael Shaw is an Abundance Ecologist and proprietor of Liberty Garden – a managed ecological oasis on the central California coast. www.LibertyGarden.com. He is also a founding participant of Freedom Advocates [formerly Freedom 21 Santa Cruz] www.FreedomAdvocates.org. He spoke on: “Sustainable Trouble; Restoring Liberty” at the concluding session of the July 2005 Freedom 21 Conference in Reno, Nevada. Credit to Terry Hayfield for his insights on artificial dialectic.